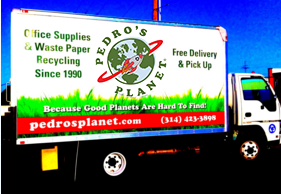 Pedro’s Planet is a company of friends dedicated to supplying your office supply needs while recycling your office waste, at the same time, during the same trip, with the same truck….for free! Of course while providing the best customer service on the planet. Want to join in our efforts? Contact one of our friendly customer service honchos/honchas to begin cleanin’ up and greenin’ up your office, one supply delivery at a time. Our philosophy has always been to care for you and care for the planet. If we can make your day easier, reduce your stress, then we have done our job. If we can provide a service that helps reduce our use of fossil fuels and the amount of waste we generate then we have done our job. That is our goal and our philosophy. In short, our philosophy is to make the planet a better place for you and all of us. To make our philosophy a reality we do little things like answer the phone. No electronic voice will answer our phone. Each of our Customer Service Honchos are trained to help you get what you need. Then we use our own drivers to deliver your supplies and recycle your office waste. Our Delivery Specialist Honchos know where your stuff goes, and where your recycling bags are, etc. This makes your day easier and you can rest knowing we will take care to recycle your waste. We also do what we can in our own office. We recycle our own waste, we compost our food scraps, and use reusable utensils and cups. We installed energy efficient lighting and a programmable thermostat to cut our energy use. It’s all part of our philosophy. We can work, be comfortable and do our part to cut down on the resources we use. These are just some of the things we do to make our office a better, more efficient place. Finally, as members of the larger community we donate time and money to environmental groups working to help the planet. Since we started this business in 1990 we have given hundreds of thousands of dollars to worthy groups in Missouri and Colorado. Our philosophy is always working to help you and others working to make the planet a better place. Our philosophy is always working to help you and others working to make the planet a better place. If you have any questions or comments, please feel free to call. We’ll answer the phone…every time!